If we are serious about following Jesus, we will be people of open hearts, open hands, and open homes. In other words, as followers of Jesus we will practice the fine art of hospitality. 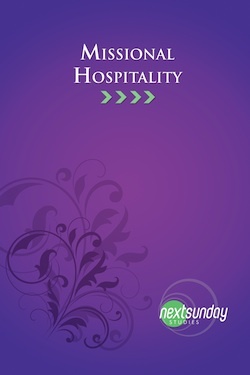 In this unit, we will study five facets of Christian hospitality. As we do so, we will be reminded that hospitality is “missional.” That is, simply by being hospitable, we will be on mission for Christ. In the first session, we reflect on a passage from Job, where Job proclaims his lifelong practice of showing hospitality to strangers. This first session highlights hospitality as a central virtue in both the Old and New Testaments. The second session specifically addresses hospitality to the poor. Our spotlighted passage is from the book of Ruth, where Boaz practically and kindly reaches out to Ruth in her poverty. The third session focuses on hospitality to sinners. We study the episode in John’s Gospel where Jesus forgives the woman caught in the act of adultery and use that passage to consider our own response to sinful people. The fourth session focuses on hospitality to newcomers, specifically newcomers in our church. The passage we use in this session is from 1 Corinthians 14, where the apostle Paul encourages the Corinthians to consider the needs of others in their times of worship. We wrap up our study of Christian hospitality by reminding ourselves that all of our hospitality is really hospitality to Christ. The final session in our study focuses on the parable of the sheep and goats in Matthew 25, where Jesus says all of our hospitality is actually done to, and for, him. The good news about hospitality is that it doesn’t require us to have money, education, brilliance, fame, or power. It only requires that we open our hearts, our hands, and our homes to the people around us.